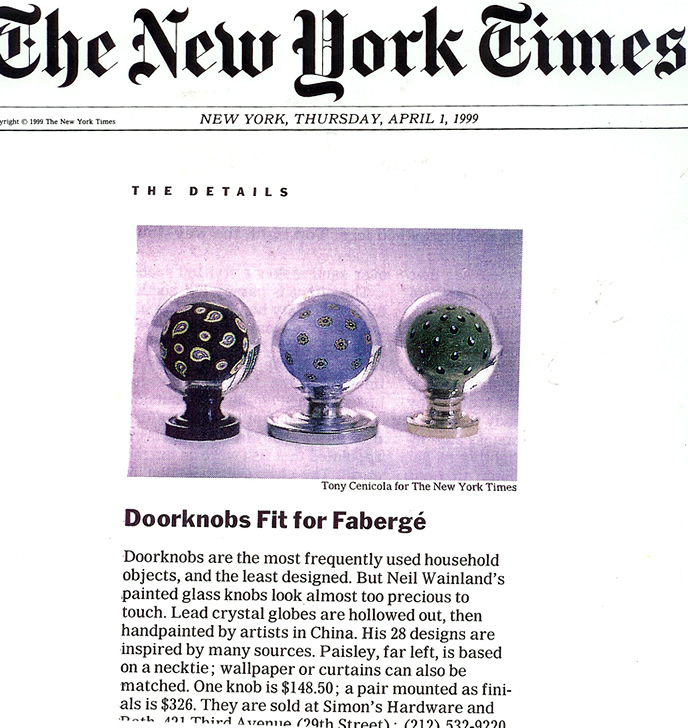 Doorknobs are the most frequently used household objects, and the least designed. But Neil Wainland's painted glass knobs look almost too precious to touch. Lead crystal globes are hollowed out, then handpainted by artists in China. His 28 designs are inspired by many sources. Paisley, far left, is based on a necktie; wallpaper or curtains can also be matched. Established in 1956, Wainlands is a third-generation, family-run business crafting anything imaginable out of metal, including HVAC grills, shower enclosures, furniture, towel and curtain rods, light fixtures, stair railings, custom harware and medicine cabinets. Working collaboratively with some of the most prestigious designers in New York, Wainlands has completed many major projects, such as creating harware for the landmark Dakota Building, building a curved stair railing for the Coach Store on Madison Avenue, generating custom brackets for Robert Stern and producing door pulls for the entrance to the new Louis Vuitton store on the 57th Street. The Wainlands are famous for their ability to solve design problems effectively and efficiently, and for their expert finishes. "We do a great many different finishes, from blackened steel and hammered nickel and pewter, to polished or satin antique brass," says Neil Wainland, the grandson of the original founder. Among their most popular items are their grills, which are all assembled by hand. In addition to their extensive line of standard grills, they can also produce custom work, cast from original antiques. "We do a lot of landmark jobs", says Neil Wainland.